I actually got it for Christmas. It's great! Crash Team Racing is alot better 10 years later, played with your best friend whilst drunk on cider. I love it when I find evidence in support of my thesis. My son turned three today...I feel a bit old. In all honesty thanks for the good birthday wish. He had a good day...cake, ice cream...more presents to litter my house with...I'm surrounded by toys. Ahh, yeah. I remember the good 'ol days, being really young and having tons and tons of toys filling the front room on my birthday. I think I was about 7/8 when my dad got me a truck load of Marvel toys, it was brilliant! That pic rules for a few reasons. 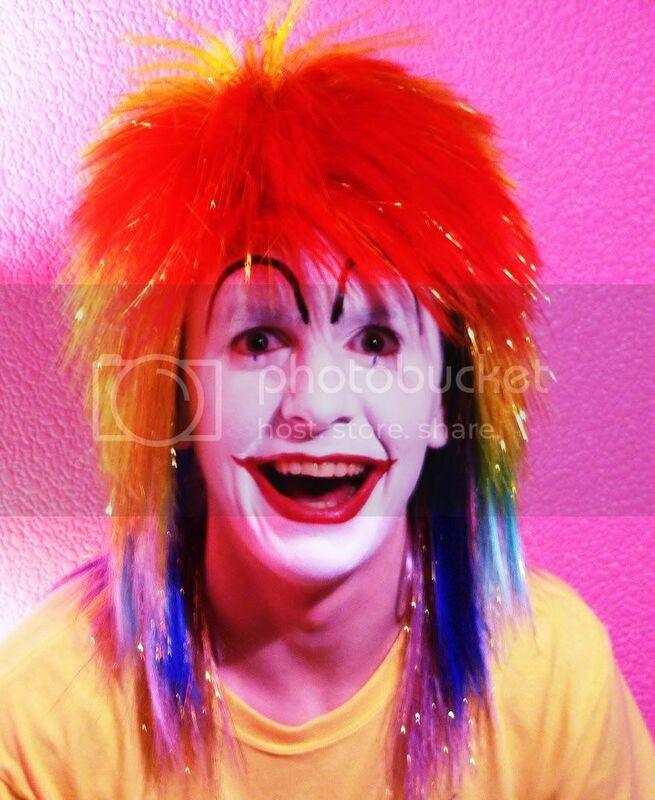 Circus didn't opt for the afro wig, rather the 80s mullet style clown wig. Secondly, as Doggett pointed out, he looks so happy. Almost as if the very fabric of his life had been woven.